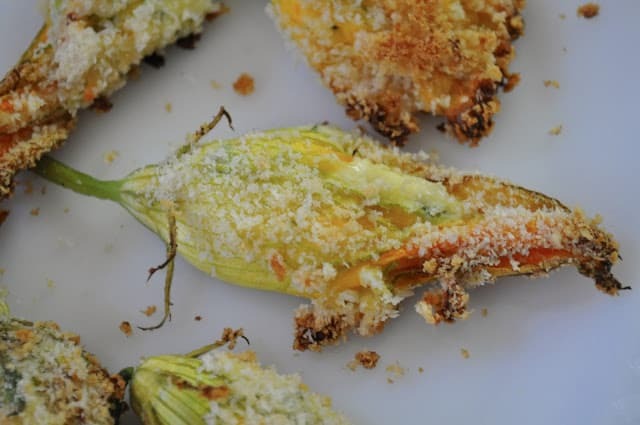 When I discovered my garden was overflowing with male squash blossoms AND that I could eat them I set about looking for a recipe to use. 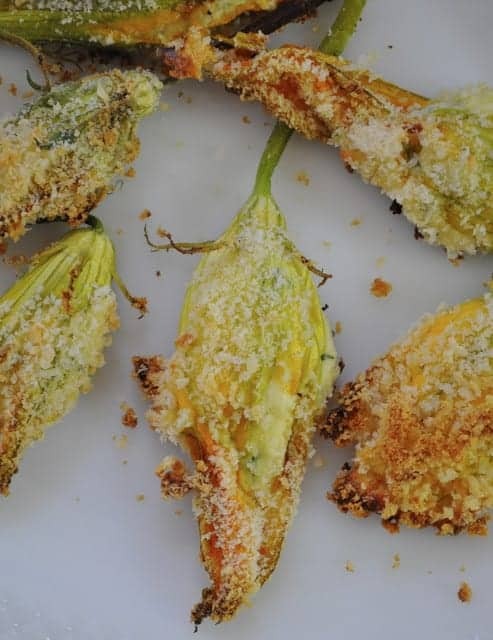 I searched online, of course, and many not all but many recipes called for deep frying or pan frying the stuffed and breaded squash blossoms. 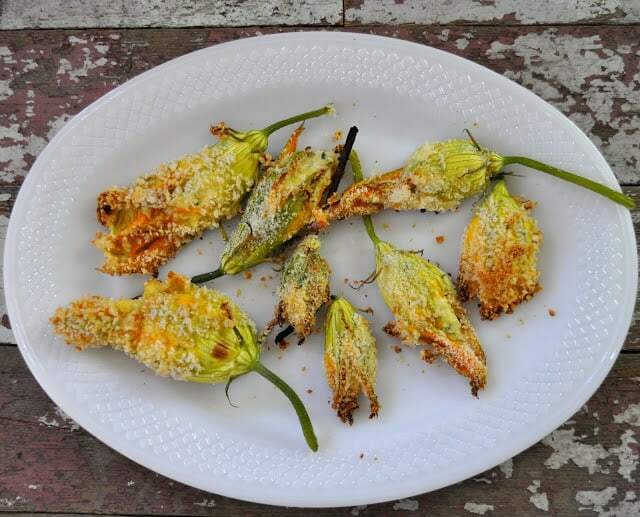 I’m just not that into frying foods, especially if it’s already a healthy food then I have a hard time frying it up, and squash blossoms are relatively low calorie, roughly 5 calories a cup. Plus I thought filling it with cheese and then frying it was a double whammy. Now I’m never one to shy away from a good piece of fried chicken or enjoy french fries but such lovely food straight out of the garden just begs for a lighter touch. Most of the recipes I found followed the same ricotta, egg, herbs, filling so I planned to use roughly that same idea. Another way to think of the cheese filling is to envision the cheese layer in a good lasagna, if you have a recipe you love for that scale it down and use it. If not follow the super easy, tasty ricotta filling I used, it’s just about perfect. 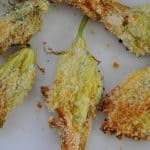 A few notes about this recipe–the amounts of filling and panko depend on the size of your squash blossoms and how much you squeeze in each blossom–so if you have HUGE blossoms you’ll probably make fewer and fill them a little more and likewise smaller blossoms will take less filling so you might need a few extra to use the filling up. I used average sized blossoms in the recipe but of course all plants will have all sizes of blossoms.